Hello winter! They say it's going to get to -2 degrees today. I had to shovel our driveway yesterday. Brrr. In fact, I'm drinking hot chocolate right now. 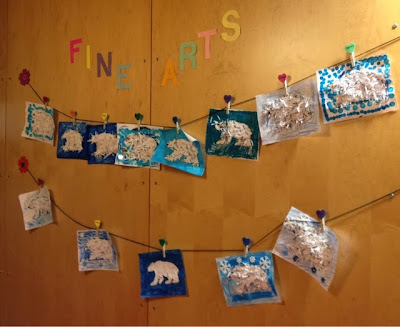 Winter is indeed here so it's time to bring some winter activities in the classroom! 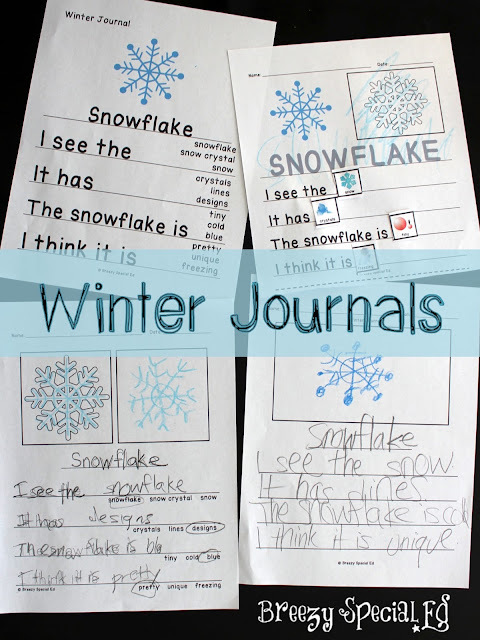 Let's get started with some winter journals! These journals are my absolute favorite as they reach all of the needs of my students. 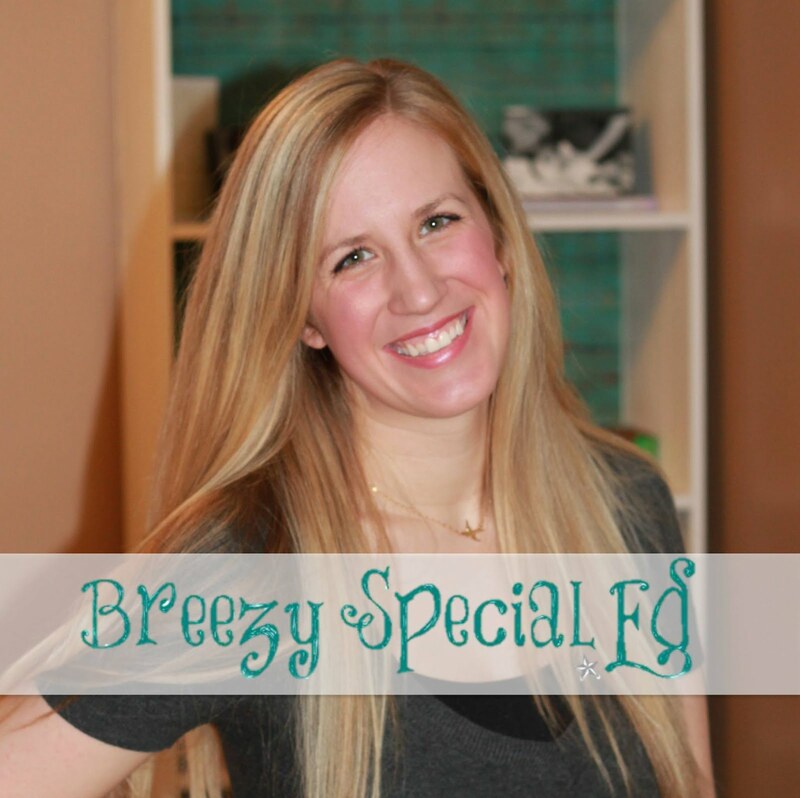 A classroom sample provides sentence starters and three errorless options. The options are errorless because so many of my students are concerned about getting the right answer that they always look for help. I want them to be successful and these journals help them be confident about their writing abilities. Level one students color the picture, trace the word as best as they can (scribbles are totally okay! ), and then choose from two visual options to complete each sentence starter. I then have my students practice reading their journal by repeating words or using their communication device. Level two students color the picture and then can draw it on their own. They then trace the sentence starters and then choose from the three options to complete their sentence, which are below each line. Level three students will draw the pictures on their own and then write the paragraph using the classroom sample and options. You can get this set of winter journals here. 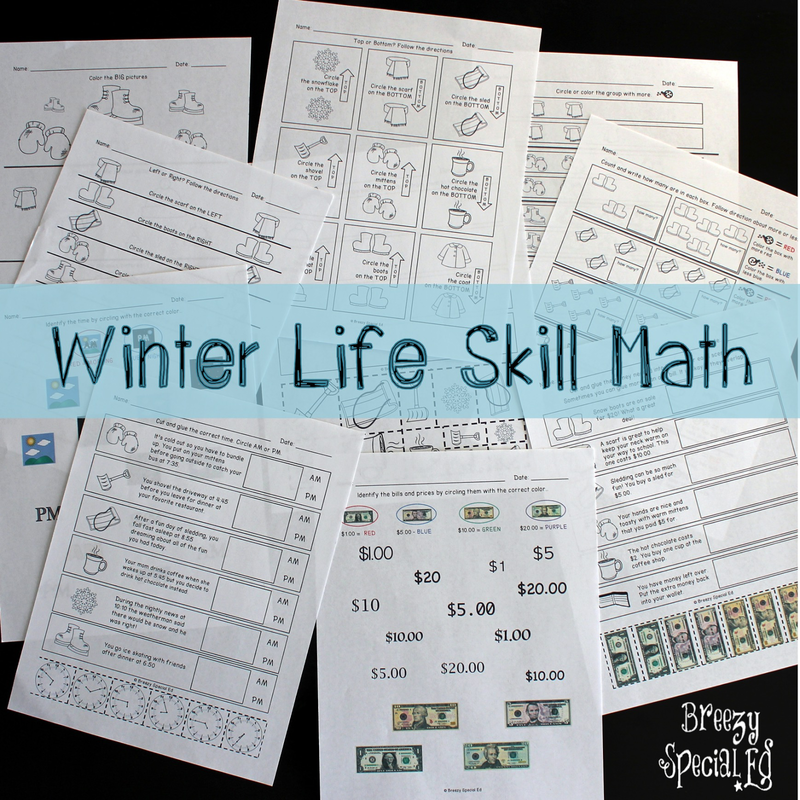 Next, bring some winter fun into your math life skill skills with this differentiated pack! Included in this winter math pack are 5 life skill topics, each including 6 different worksheets at 3 different levels (plus 3 bonus number worksheets). Money: Level 1 works on recognizing and matching bills. Level 2 works on matching bills to their dollar amount. 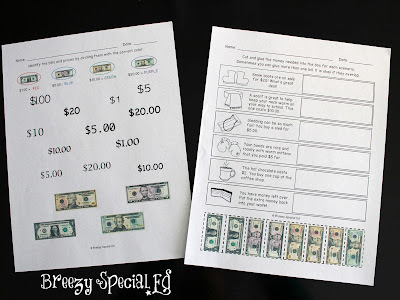 Level 3 works on combining multiple bills to reach certain dollar amounts. A reading component is included as scenarios such as "You want to go sledding with your friends, but you need a new sled. Go to the store and buy one for $15." 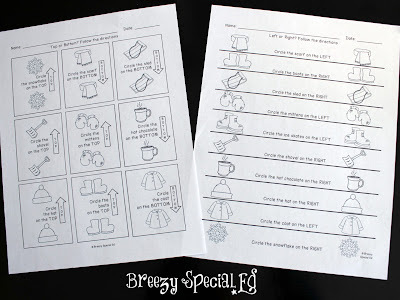 Pictured is a level 2 and a level 3 worksheet. Directions (Top, Bottom, Left, Right): Level 1 works on these directions using arrows as support. Level 2 works on following directions without the arrow support (using the word only). 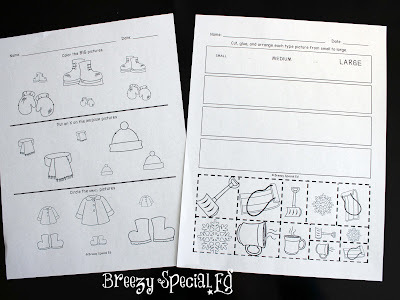 Level 3 adds a little extra to the level 2 worksheets by adding a part to the directions in the front, so instead of "circle the boots on the left" it might say "color in" or "draw a line under" or "put an X on", etc. 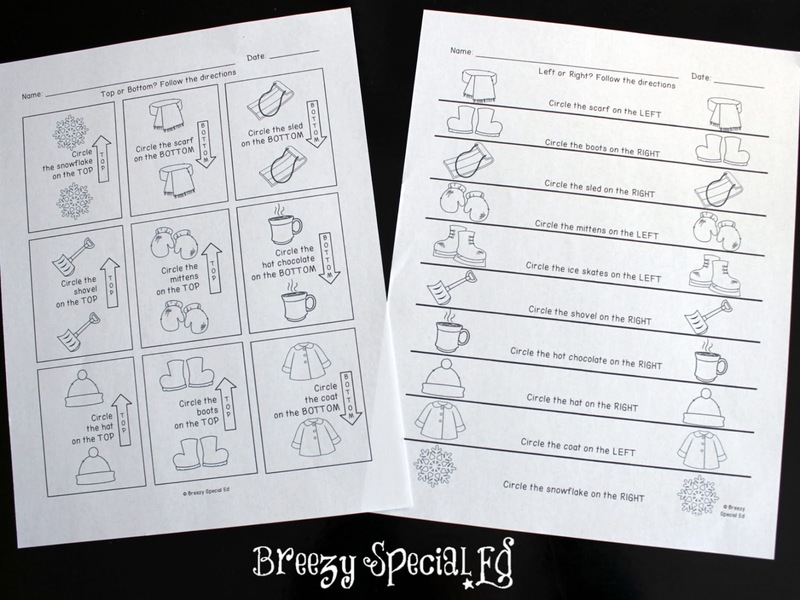 Pictured is a level 1 (top/bottom) and a level 2 (left/right) worksheet. More/Less: The main difference between the levels on these worksheets is the amounts. Level 1 goes up to 3. Level 2 goes up to 5, and level 3 goes up to 10. 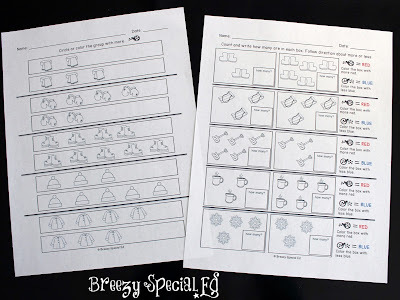 Different worksheets ask students to circle the group with more or to count and number each group and then for level 3 figure out how many more are in the box with more. 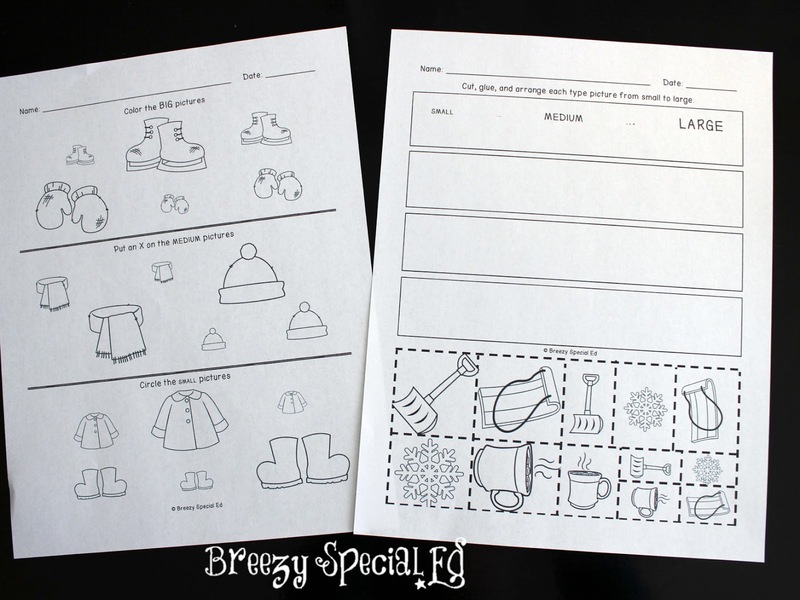 Both worksheets pictured above are level 2. Sizes: Level 1 works on big and small only. Levels 2 and 3 work on small, medium, and large. Level 3 also works on arranging in order of size where the other levels just sort between the sizes. Pictured is a level 2 and a level 3 worksheet. 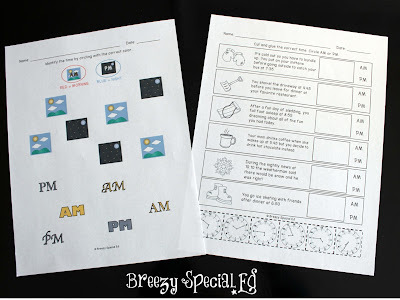 Time: Level 1 works on recognizing the difference between morning/night and am/pm. Level 2 focuses on digital time to the hour and half hours, with some analog time. Level 3 works on analog time to the 5 minute intervals. Each level also includes a reading component along with the time, and level 2 and 3 also reinforce am/pm concepts. Grab this math pack here. 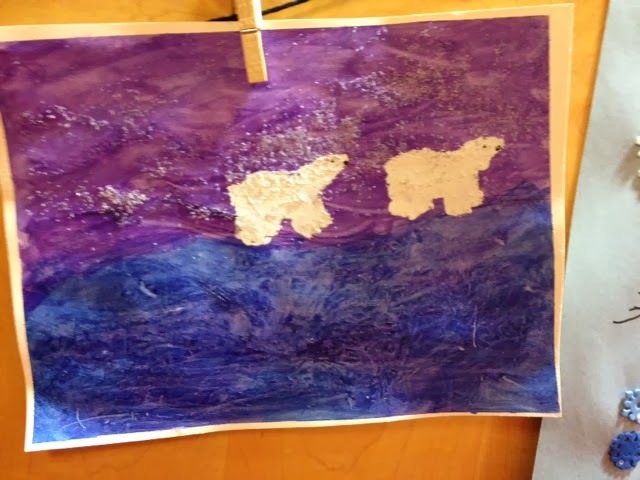 Of course, language arts and math are essential to every school day, but crafts are oh so much fun too! So here's a few of my favorite wintery crafts. 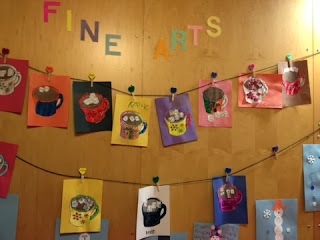 or there's this awesome hot chocolate sensory craft!! Check out all of these crafts (and more) with links to their instructions here.